My posts from this leg have been long and I’m happy to get a shorter one to get a break, ha! Today was more straight forward. 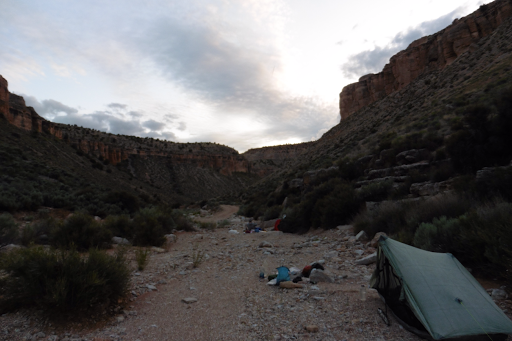 We woke up from our perfect campsite at Showerbath Spring and just had a bit further to go up Kanab Canyon before reaching Jump Up Canyon and officially leaving the Grand Canyon. Both of us were really groggy and in zombie mode much of the morning. These last few days of rain and difficult terrain has slowly taken its toll. My feet are not happy campers. They are swollen from being wet and on rocks for multiple days. 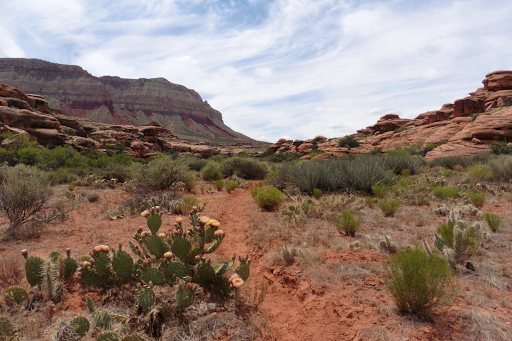 The constant gravel in my shoes from crossing Kanab much of yesterday seems to have tipped the scale to unhappy feet. The balls of my feet have developed something like one big callus and the nerves are prickly. I hoped we’d have less rocks today and sadly we didn’t. 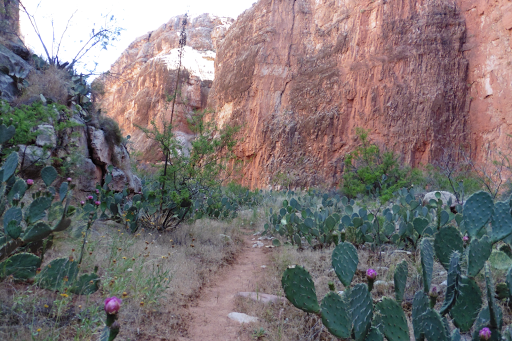 There were some nice game trails off the rocks from time to time and they were filled with what we called cactus gardens. So many and some were still in bloom with other flowers around them. I liked them. 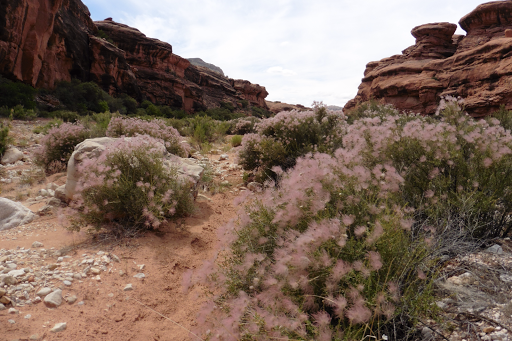 Kanab did dry out as we hiked up and we knew water would be intermittent up canyon, but it was a gamble when to grab for the long haul of dry for 20-30mi to come. 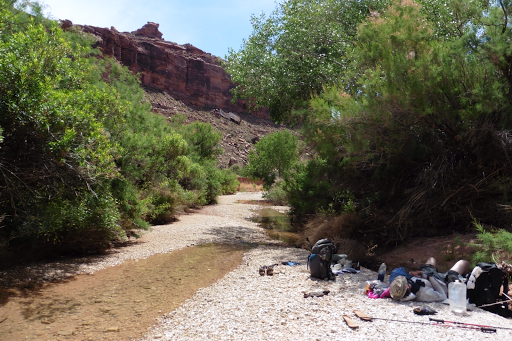 I was frustrated with my feet pain and chose to risk it and didn’t get water from camp, like Gavin did. I passed the early streams that were now clear after the clay mud had a chance to settle overnight. I was convinced more sources would come and they did…but they were filled with clay mud again. I started to ration, kicking myself for playing the water roulette game. 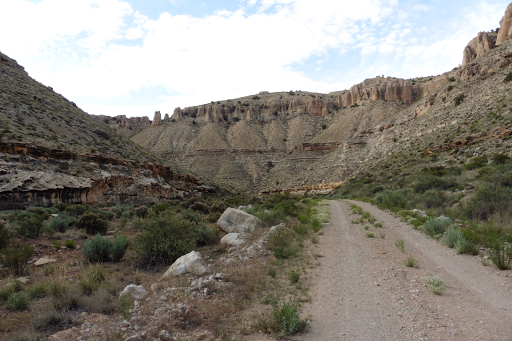 We turned into Hack Canyon and it was even drier with a wash and then higher game trails to keep you up out of the wash. 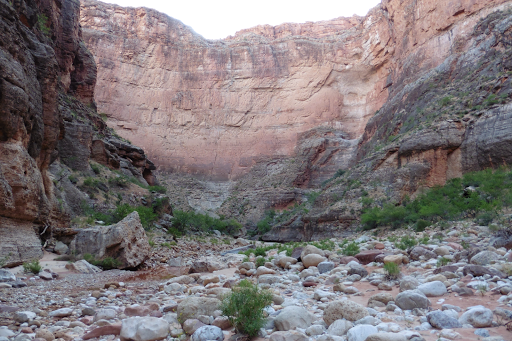 Soon into the canyon, I noticed brush and trees down in the wash and got hope…It was getting hot now that the days of clouds finally cleared and I saw a shadow under the tree in the wash…then I noticed it wasn’t a shadow, it was water! 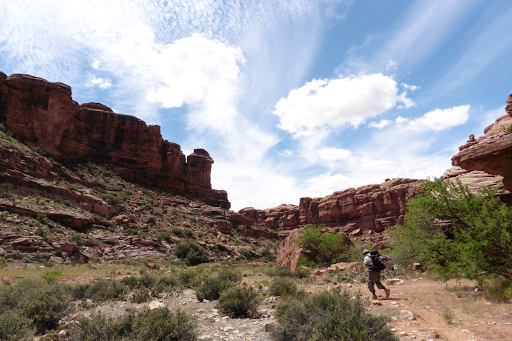 We weren’t sure if it would last and be further up the wash, so we bushwhacked down and had lunch at our last source for 20mi. We took an extra long break and I made my dinner there knowing I wouldn’t have water to cook tonight. As we packed up to leave, I saw Katherine hiking up on the game trail and called over to her to make sure she saw the water. We knew she was about an hour from us from rafters that saw her yesterday and expected to see her today, but had yet to hear how the alternate she took, called “Three Days of Terror” went and how she was already here. Good news is that she’s all ok and safe. She did 1.5 days of terror and decided to exit back to the route we were on given the conditions of water, pack weight, and safety. She gave it a good go and so did the guys a couple weeks ahead of us and all exited at the same point. It sounded like the name was justified. Good to know she’s okay. Her pants are as torn up as Gavin’s, so she’s sporting the shorts. The frustrating part on her end was that she did that route to not be in the Hayduke herd and needing some solitude, but now she’s right in the middle again with Wyoming, Freebird, and the brothers right behind us. With us slowing and her exiting her route early, it’s just a poor coincidence and not much we can do about it. 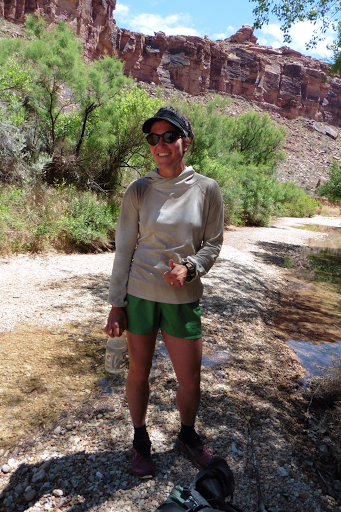 She stayed at the water and we hiked on through Hack Canyon. 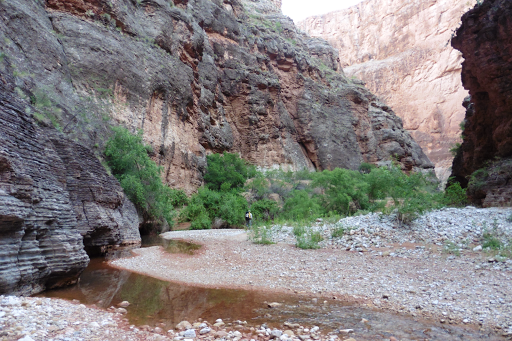 It was a really nice canyon! 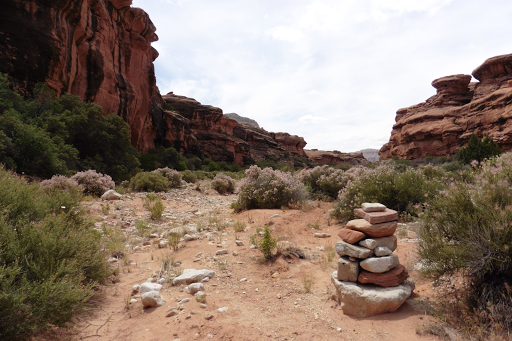 It is an actual trail and had many large cairns leading the way as the trail went up out of the wash as it zig zagged over it. There was more sand, which helped my feet and some rocky parts still mixed in. It was a HOT afternoon and the umbrella and MP3 player were key to my sanity. I listened to more of We Are Not Oursleves. The last couple hours of the day was on dirt/gravel roads and that will be the case for the next 30mi or so into town. Fast and mindless miles, which is a welcomed change.